Constantine "CJ, Chris, Connie" J. Testone, age 82 of Vineland, passed away on Friday, January 17, 2014 at home. Constantine was born in Derby, Conn., to the late Constantine and Ida May (Smith) Testone and graduated from Fairfield University in 1953 with a degree in Social Science. 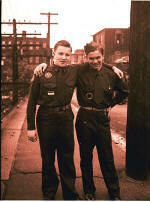 He served with distinction in military intelligence from 1954-1958 in Berlin, Germany. Following his military career, CJ began his Boy Scouts of America professional career in 1958 as an Assistant District Executive in Nassau County, Long Island, NY. In 1959, he was promoted to District Executive until 1963 when he was selected to serve as District Executive in Middlesex Council, Highland Park, NJ. In 1964, Connie was selected to serve as District Executive in the Transatlantic Council, Heidelberg, Germany. Among his many assignments two are most noteworthy. He founded Camp Heritage, a self-reliant summer camp in Germany which still exists today and also served as the American Liaison officer at Kandersteg International Scout Chalet in Switzerland. Following his overseas assignment, Chris was selected to serve as Program Director in the Suffolk County Council, Long Island, NY., in 1968. In 1970, he was promoted to Director of Support Services. Among his many contributions, he was instrumental in substantially improving the camping program of the Council including the acquisition and construction of a self-reliant camp in the Adirondacks. In 1975, CJ was selected to service as Scout Executive of the Southern New Jersey Council, Vineland, NJ. He successfully served in that capacity for 22 years, retiring from the professional services of the Boy Scouts of America in 1997. After 39 years of service, some of Connie's notable achievements included: growth of the Council Endowment Trust Fund assets from $70,000 to 5.5 million dollars, construction of a new Scout Resource Center valued at 1.5 million dollars, completed a major capital campaign resulting in acquisition of camp properties and camp improvements; and introduction of new outreach programs for minorities and the handicapped. 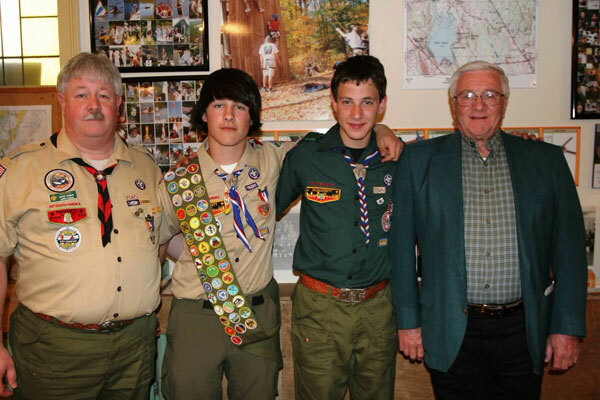 Chris is a 60 year veteran of the Boy Scouts of America having achieved the rank of Eagle Scout in Troop 3. He has served as and Asst. Cub Master, Asst. Scoutmaster, Committee Member and Scout Master. He has earned the Scouters Training Award and Scouters Key. Chris is an Ernest Thompson Seton Member of BSA's 1910 Society and a multiple James E. West Member. He has been honored by his community and the State of New Jersey for his outstanding service to youth. He has been a member of the Kiwanis International, Rotary International, Chamber of Commerce, United Way, and many local community organizations. Constantine was predeceased by his brothers, Lawrence and Joseph Testone, and sister Marie A. (Testone) Kashuba. He is survived by two brothers, Jackie (Clara) Testone and Henry Testone. He is also survived by his two daughters, Carol (Testone) Warren and her husband Elmer of Millville and Patricia (Testone) Grablow of Vineland and one son, Shawn Testone and his wife Robin of Horseheads, NY. Also four loving grandchildren Serena, Julianna and Michael Testone and Cassidy J. Grablow. He is also survived by dear cousin, Clara Finnucan, as well as many nieces and nephews. Funeral liturgy will be held Friday, January 24th at 11:00 AM from Chris the Good Shepherd Parish, Church of St. Isidore 1655 Magnolia Road, Vineland. Burial will be private. Visitation hours are 9:00-10:45 AM Friday in CHURCH prior to the liturgy. Please visit wbfuneralhome.com to send on line condolences and or tributes to the family. In lieu of flowers, donations in Constantine's memory may made to the BSA at BSA Troop 3 Derby, PO Box 8, Derby, CT 06418 or the American Diabetes 1701 N. Beauregard St. Alexandria, VA,. 22311 or by phone at 1-800-342-2383. Arrangements are under the supervision of Wainwright-Bernhardt Funeral Home, Vineland, NJ. 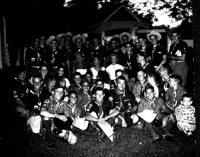 Walter Petz, a long time member of the Scouting community passed away on Dec 5, 2007 at age 95. Born Aug. 15, 1912 in Ansonia, the son of the late Adam and Anna Korlak Petz, Walter Petz’s interest in Scouting began in 1923 when he spent a weekend on the estate of Ernest Thompson Seton, one of the founders of the Boy Scout movement in America. Walter wasn’t allowed to join a scout troop because it was soon after WWI and some parents thought that it was of a military nature. However in 1937, after marrying Rod Kneen’s sister Carolyn and moving next door to Ed Strang, he became an Assistant Scoutmaster in Troop 3 at Ed’s invitation. Walter earned his Eagle Scout Rank as an adult, which was allowed back then, and became Troop 3’s 28th Eagle Scout because, according to Walter “If I was going to lead and train Scouts, I wanted to learn as much as I could about Scouting”. He remained actively involved in Scouting the rest of his life. When Explorer Post 33 Advisor George Kneen left for Air Cadet School, Walter became its leader. During the war years Explorer Post 33 became an Air Squadron Post. Walter was also a 60 year member and “Head Foot” of the Wingdorf Pazorkas society of Troop 3 Committeemen. In 1972, Walter was Chairman of the dinner celebration honoring Ed Strang for 50 years in Scouting. More than 600 people attended this event. For many years Walter served as Treasurer and Institutional Representative for Troop 3 Derby and as a Citizenship, Pets and Gardening merit badge counselor. The Walter Petz Citizenship Award and Scholarship is presented annually by his grandchildren to a graduating Troop 3 scout in honor of their grandfather. Walter organized and for many years directed the committeemen’s “Petz’s beauties” in the annual Minstrels and Gang Shows and in 1985, was responsible for Ed Strang receiving a congratulatory letter from President Ronald Reagan for his many years of directing the “controlled chaos” of the Minstrels and Gang Shows. Walter also served as emcee at Pack 3’s Blue and Gold banquets for many years. Walter has been presented with the President’s Award, District Award of Merit, Silver Beaver Award and James E. West Fellowship Award by the Housatonic Council and National Boy Scouts of America. He was also honored at Troop 3’s 85th Anniversary dinner with the “3 for Life” award for lifelong dedicated service to Pack 3, Troop 3 and Crew 33. Walter was a seventy-year member of the Boy Scouts of America. Outside of Scouting, Walter was the proud father of Susan Davis, Judy Petz and Carrie Sharkey, the grandfather of seven, great-grandfather of eleven and great-great-grandfather of two. Walter and Carolyn, his wife of 69 years, were devoted members of the Derby United Methodist Church, where he was a Trustee and where he served as Superintendent of the Youth School for 24 years. Even at age 90 Walter continued to work at Latex Foam as a manufacturing machinery consultant and he was a long time member of the Valley Transit District representing the city of Shelton as a director, appointed in 1971. Walter Petz lived a long and prosperous life. He was very proud of his role in Scouting, especially in helping Scouts to become good citizens. He lived his life by the Scout Oath and Law. Troop 3 was certainly blessed to count Walter Petz as a member for 70 years. He will be missed. DERBY — The old helped usher in the new at an end-of-the-year gathering that saw generations of Troop 3 Boy Scouts officially mark a current member's passage to Eagle Scout rank. Nicholas Frovarp's Eagle Scout Court of Honor ceremony last Wednesday doubled as the troop's annual "Old Timer's Night," bringing dozens to Second Congregational Church, the longtime venue for local Scout meetings. In addition to reuniting with alumni, Troop 3 affiliates used the dual-purpose event to extend their congratulations, well-wishes and plenty of advice to 17-year-old Frovarp. "Don't be afraid to make mistakes. Don't be afraid to try new things and fail," said Assistant Scoutmaster Mike Breault, commenting on parallels between challenges Frovarp will face in life and the determination it took to complete his Eagle Scout project.